You receive an anonymous invitation to board a luxury cruise ship… Do you heartily say yes? Do you politely say no? Or do you think to yourself: "Hang on a minute, isn't this like the start of a horror movie?" before running as fast as you can in the opposite direction? Well, our lead character from CIRCLE Entertainment's Parascientific Escape: Cruise in the Distant Seas decided to take the first option and seems to have placed herself in a whole lot of trouble. 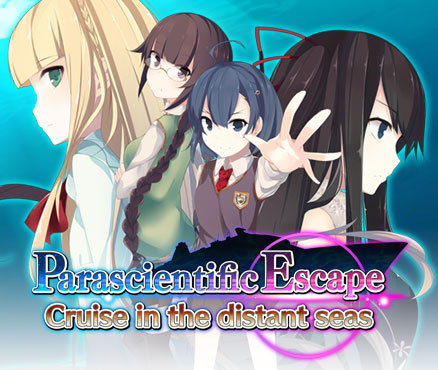 The game sees 16 year old Hitomi Akaneno – a school girl who is one of an ever-growing race of people who have developed psychic abilities – take up this invitation and board The Idinaloq, a luxury cruise ship. Not long after departure an explosion sounds and she finds herself trapped in a suite with nothing but her psychic powers to help her escape from a ship that is now sinking. Your job is to help her not only escape, but also to figure out what exactly is going on in what turns out to be a far more complex situation than initially assumed. Whilst having all of the qualities of an escape game, Parascientific Escape is also a story adventure at heart; the majority of time you'll spend with this game is reading dialogue between the story's main characters, learning more about your surroundings and the events that led to the present day. All information, and even descriptions of the objects you interact with, are presented through either communication between characters or Hitomi's inner monologue. The story focuses on four girls: Hitomi; her best friend Chisono, who boarded the ship with her and has the ability to talk to Hitomi using only her mind; Misaki, a famous singer who was on board the ship to entertain the guests and finally Merja, the daughter of the CEO of Amabishi International Industries – a major corporation. Merja has a particularly interesting role to play in this story, as when Hitomi first meets her we discover that she has had a bomb placed around her neck, with instructions on what she must do in order to survive. Hitomi's natural instinct is to help Merja escape too, and suddenly the game begins to get even more mysterious. There are many twists and turns, with new theories formulating in your head as you progress and the nagging feeling that these characters were all surely put together for a reason. We won't spoil anything here, but there is fun to be had in trying to work out what is going on. Aside from the dialogue and storytelling, Parascientific Escape has two main modes of gameplay. The first of these has hidden object feel to it. As Hitomi you will explore the ship looking for clues that may help you either get closer to escaping, or to learn more about what has happened. This is done simply by tapping anything that catches your eye on the touchscreen. Hitomi will either pass it off as being something 'ordinary' or will examine it further, sometimes taking the item in case it might prove to be useful. 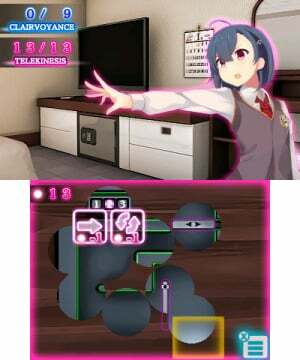 The other mode comes into play after interacting with certain items that could contain something inside, often doors, closets or safes that are locked, for example. Here, Hitomi can use her two psychic powers to full effect. The first power is her Clairvoyance which sees you touching the area you're searching on the touchscreen to see inside it. At first the area is completely opaque, but by touching an area that intrigues you with your stylus you can start to create small windows where you find any objects inside that might be useful. The amount of times you can open these small windows is determined by how many Clairvoyance points you have – this is indicated on the top screen. Each touch of the stylus takes away one point until eventually you will be left with none, ending the Clairvoyance round. You can increase the amount of points you have to play with by collecting 'ether' throughout the game. This can sometimes be found by completing Hitomi's psychic exercises, or sometimes if you're lucky just by clicking on objects. Once you have got a good view of what's inside you can move on to power number two: Telekinesis. Here, you can move anything inside the area you're searching by either dragging or rotating it. Again, each rotation or drag movement takes up one telekinesis point – also indicated on the top screen – so you can't afford to make too many mistakes. In these sections you'll often find yourself trying to remove a key or similar object, but will find things such as pens or notebooks in the way. Working out how to move any hindering objects out of the way in the least moves possible is the challenge here. At all times you have access to a menu which serves as a place for storing items you've collected, saving the game, and much more. As the game progresses this menu becomes more and more useful – eventually you'll be able to travel to all the places you've been before through one quick click of a button, rather than having to journey across the entire length of the ship just to pick up a pencil that you didn't bother with before. There is also a really handy hint system for if you get stuck. 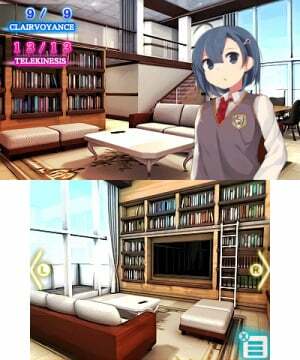 Clicking on 'Hints' provides you with a list of all current mysteries; by choosing one Hitomi will go back over conversations in her mind, or else think to herself about possible things to try – giving you a good idea where to start looking without simply throwing the answer in your face and ruining the experience. 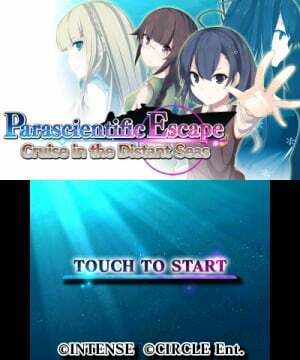 Parascientific Escape does exactly what it is trying to do. A gripping story – albeit sometimes almost too fleshed out - a great visual appearance and a very enjoyable gameplay system all contribute towards an enjoyable visual novel. Sometimes the dialogue sections can feel quite draining, especially if you've been playing for quite some time and enter a particularly lengthy section, as it is impossible to save your progress at these points, but for the most part they work really well. A must try for fans of the story adventure and escape genres, and maybe a good place to start for anyone else who is interested. Sounds.... familiar. A game to while away the time while we're waiting for Zero Time Dilemma, perhaps? What a nice surprise. I may just have to pick this up. Circle really is hit or miss these days with them hitting a bit more than in the past. Now where's My Nintendo so I can start dl'ing games again?? They really should do some work on the text in the game. Several misspellings and grammatical errors. It's also annoying that you cant save during the dialoge parts that can drag on a bit. I do enjoy the gameplay though. I loved the characters. I hope the sequels get localized, too. @Sticker Your avatar is pretty ironic then. CIRCLE is a localization company and not a developer. Intense developed the game. Thanks for the review. Been waitin out on this, but now...why not? Welp, this was an unexpected surprise. I'm gonna get it. @Sticker Said the person with the weeaboo-fueled avatar. @Big_Gamer You should see their grammar on Twitter. Makes sense when you see that. Is it too much to ask if it's 3D? I'm for supporting the localization of console VNs, especially those on Nintendo consoles. For $5, I might give this a try, just not now. ooh, this looks fun. need to finish zero escape first to make room for it! Ooh, 5$. Surely won't hold a candle to Zero Escape, but may tide me over for a bit while I wait impatiently for Zero Time Dilemma. I'll get it. I doubt it's anywhere near as good as Zero Escape games but I'm always up for another visual novel. I just bought both Another Code games and Hotel Dusk. Started the latter yesterday and I really like the artstyle. The production values aren't as good as Zero Escape, for sure. As has already been mentioned, there are plenty of spelling and grammatical errors and some odd sentence construction in places. The localised text could have done with a once-over by a native English speaker. I'm not too bothered by that myself, despite the fact that, as a professional proof-reader, spelling and grammatical errors usually really annoy me. Don't get me started on the non-existence of English-English (as opposed to American-English) in the UK version of AC:NL - every time I get a letter from "mom" it makes me grind my teeth. The puzzles so far have been of the "find the key" type, not really Hidden Object, more "what's that under the table?". The Telekinesis puzzle I've done is what you'd get if you crossed Kim's Game with a parking puzzle - you get to see where the obstacles are using Clairvoyance, but have to remember their locations and your route in Telekinesis mode. I expect the puzzles will increase in difficulty as I progress through the game. The screens are clean and well presented. The characters are likeable and interesting, and the conversation options well laid out. I really like the Hints system, which allows you to play in chunks of time with a long break between if you want to without needing to remember what you need to do next. For a £4 game, of a type that's rather rare in the West and very Japanese in setting and characters, I'm very happy with this game. You'd pay roughly the same amount on the App Store for a couple of generic Escape the Room games with no characters, no real story and at most a couple of hours of gameplay. This is a bargain, and a bit of a gem. It's not Zero Escape, but it is a similar experience - just a little rough around the edges in terms of text. If you enjoyed 999, VLR, Escape the Room puzzles or Visual Novels with a bit more to do than just read the text, you'll enjoy this game. I really hope the sequels come to the West as well, and do well enough that Intense makes more games like this. So... basically this is pretty much 999 but with slightly different characters? Literally the plot sounds the exact same. My God, a properly good CIRCLE game? Interesting...but seriously, I can only imagine that the word 'papascientific' is totally made up or it was put right through Google Translate. @Sticker Echoing almost everybody else here: Your avatar really makes it hard for your comment (which also seems to be based on lack of experience with the game mind you) to be taken seriously. I mean you have Ms. Tsundere 2012/2013 and 2015/2016 as your avatar. She moonlights as Ms. Yandere as well. Anyway I'm getting Sadame first then I'll pick this game up. The funny thing is Sticker isn't the only Fire Emblem Fates fan that I've seen that's in the anime closet. I've seen a lot of post Fire Emblem: Awakening Fire Emblem fans continue to claim things like anime is disgusting. Tucked this in my wishlist looked interesting, but I'm broke so it'll sit in my wishlist for a while. @DarkKirby I liked Fire Emblem Fates/Awakening, but I don't really like anime at all. 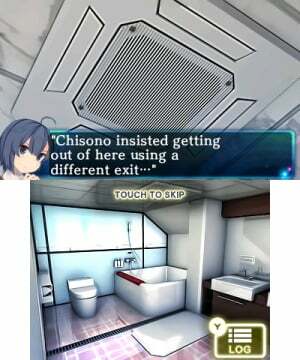 Some of the game's dialogue made me cringe into another dimension though. Doesn't sound bad. I may try it someday. Eh, it was okay. Dialogue could've used another pass and the plot's nothing I haven't seen done better elsewhere. The psychic puzzles reminded me of a Layton game, only they didn't feel shoehorned in, so that's a plus. There's plenty better VNs out there (even just on 3DS) but for the price it's worth a look.